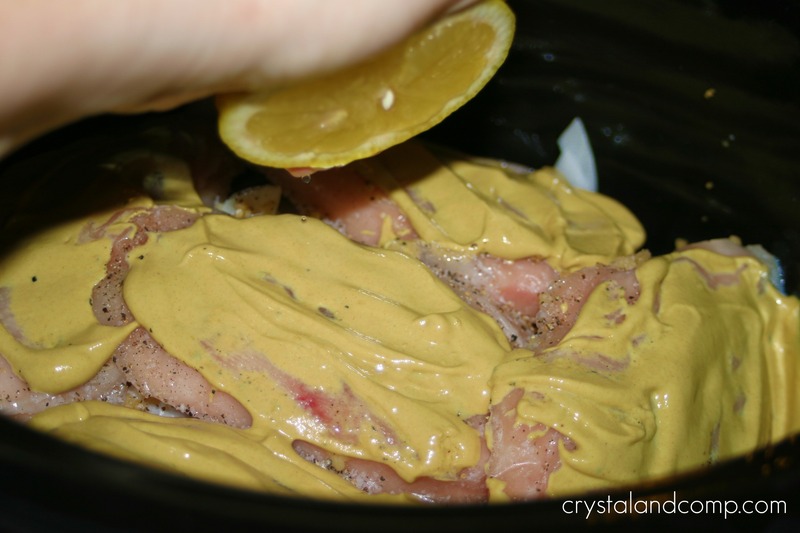 A while back one of my wonderful Facebook readers, Erin Burns, shared a delicious crockpot recipe with me. I’ve made it about 5-7 times now and it is super yummy. 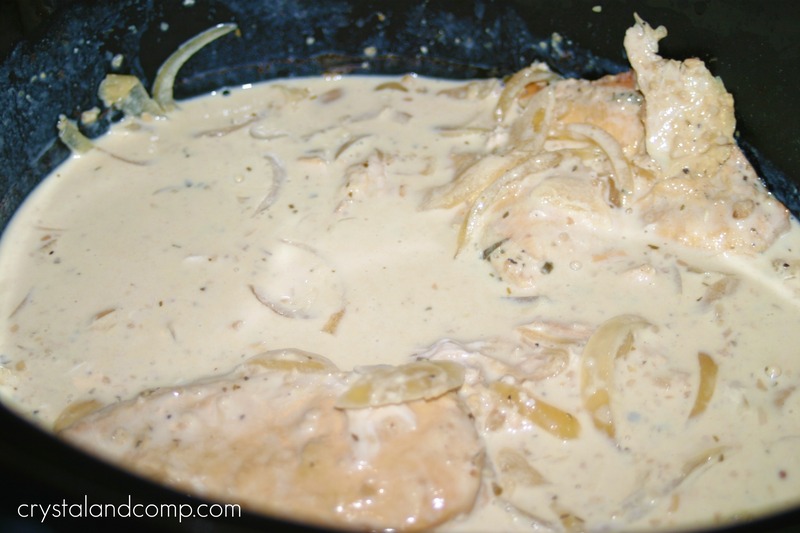 I’ve also shared the recipe with family and friends and they have enjoyed it as well. I love that it partners well with pasta and my kids gobble it up. It goes well with fresh fruits and veggies, too. This is more of a fancy crockpot meal, as it has more steps in it than my recent super-simple-plop-and-go recipes.You’re gonna love it. 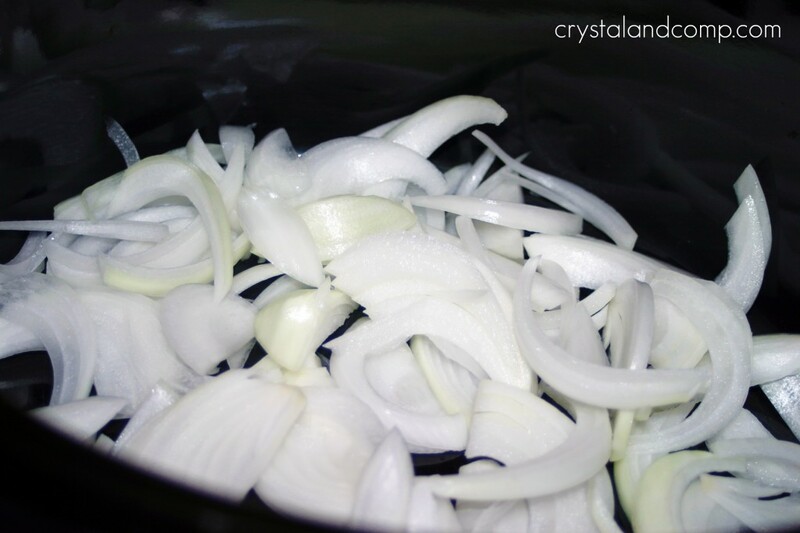 Add the sliced onions to the bottom of the crockpot. 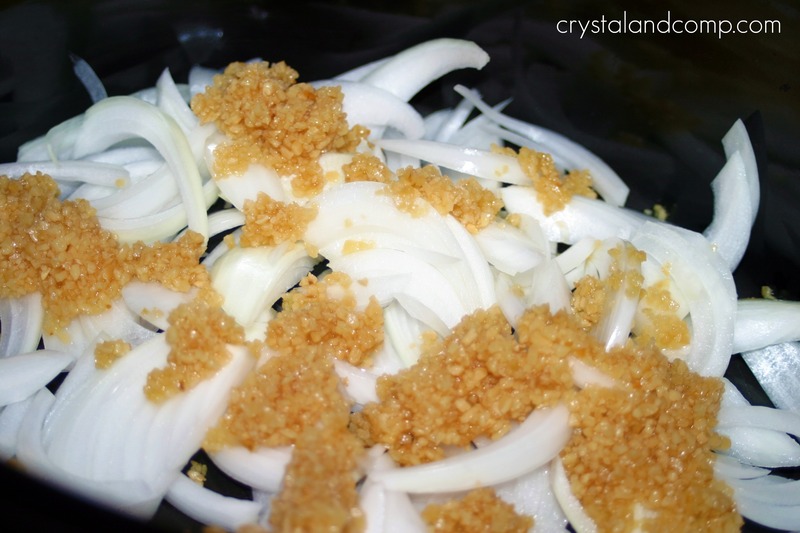 Add the garlic on top of the onions. Add your chicken pieces (I used breasts and threw them in frozen). 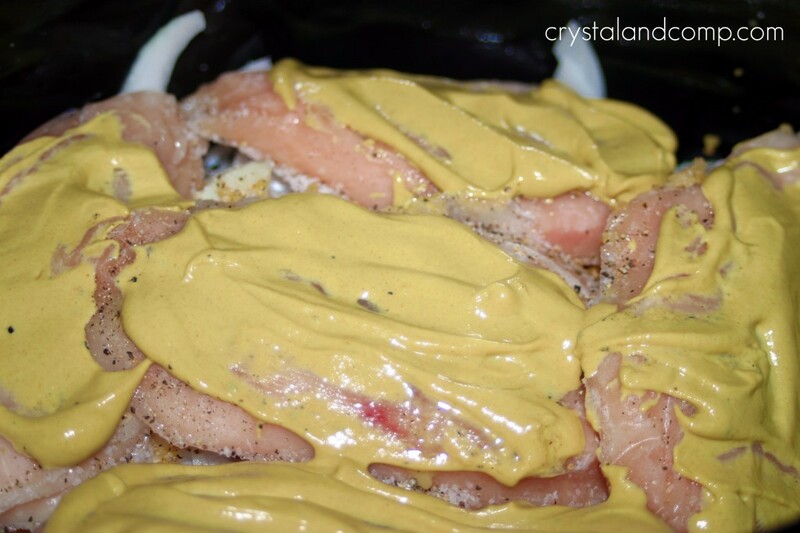 Cover the chicken in Dijon mustard. Add the chicken bouillon. I used chicken broth. Sprinkle with tarragon or add fresh tarragon leaves. Cover and let it cook on high for 4-6 hours or low for 8-10 hours. Once it is done cooking, remove the chicken and the tarragon if you used fresh springs. 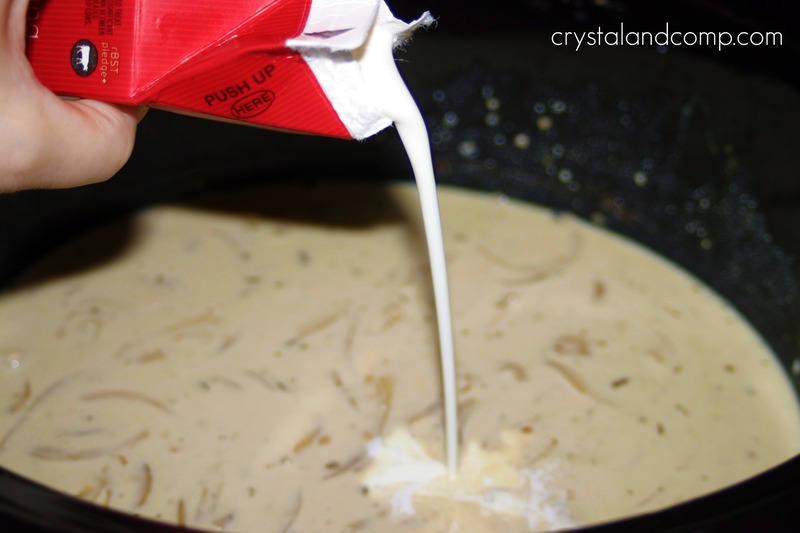 Add the heavy cream to the crockpot and mix well. 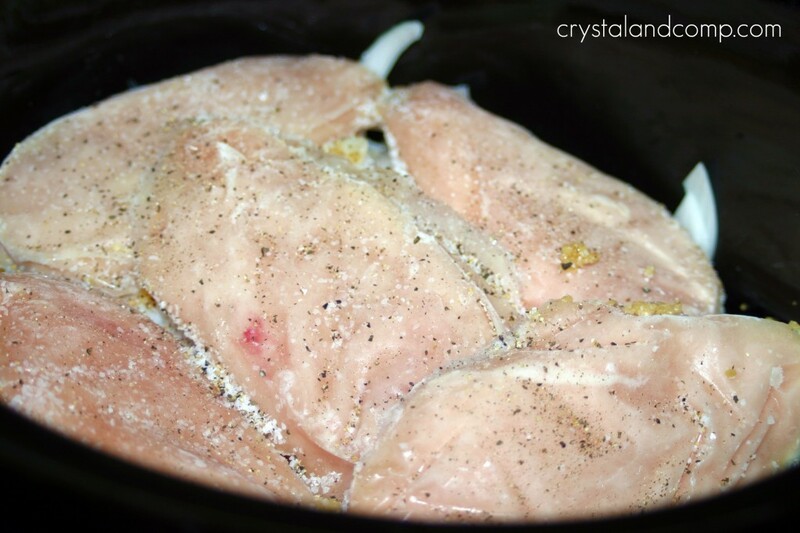 Return the chicken to the crockpot and leave it on warm until you are ready to serve. 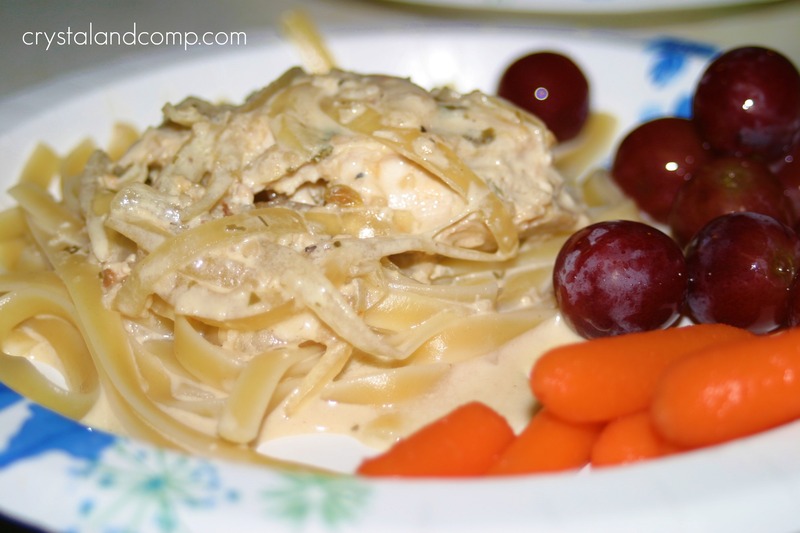 We like to serve the chicken over fettuccine noodles with sauce over top. Super yummy- you’re gonna love it. Is there a recipe you would like to share with me? Send it to me. Sprinkle with tarragon or add tarragon leaves. For extra lemon flavor, place a couple of slices of lemon on top along with the tarragon before cooking. Mmmmmm that looks & sounds amazing! 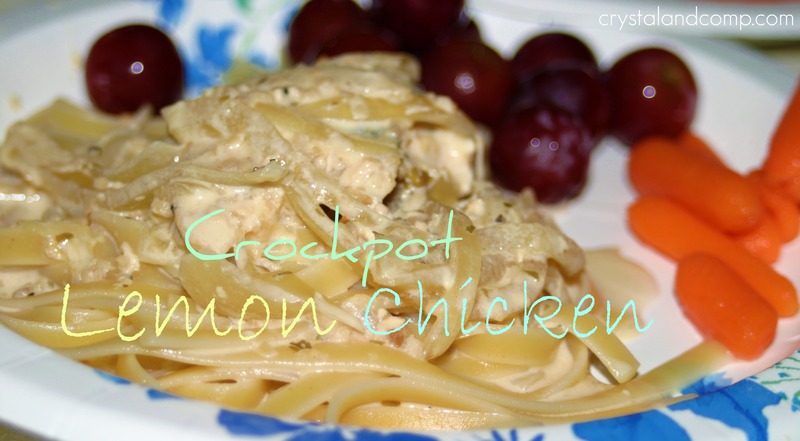 I love crockpot meals. I can’t wait to try this. It looks so delicious! YUMMMMY! 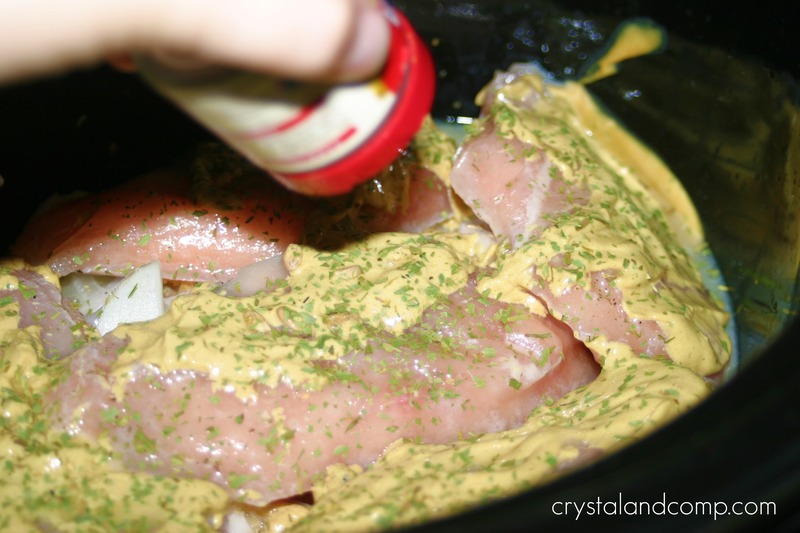 We will be trying this in our beloved crock pot. Thanks for the recipe. I am looking forward to trying this recipe. I have one very long teaching day and I like to load up my crockpot in the morning so supper is ready when we all get home. I think my family will enjoy this. Thank you and I am enjoying your blog! Ooh that sounds so good!! Thanks for sharing! This looks soo delicious. I can’t wait to try it! Love your blog, just came across it. I am going to have to visit it regularly!! You’re right, Crystal, I love it! Great recipe! I’m thinkin’ this could easily be increased to serve our Wednesday crowd at church. Thanks for sharing! Made this last night! Family absolutely lved it. Thank you for sharing. Just made this! Amazing! Haven’t even had dinner yet… can’t stop tasting it! That is so awesome, Leslie. We love it too! Is there an overwhelming taste of mustard in this recipe? I don’t love mustard, unfortunately, but this otherwise looks and sounds good! You could always cut back on the mustard a bit if you want. This looks really, really good. I just found it on pinterest and can’t wait to try it. One question though: It says in the ingredients that you use peeled garlic. But the picture does NOT look like three cloves of peeled garlic. It actually looks like minced garlic from a jar. Am I missing something? Thanks! Yap, I use jarred. I believe the jar says 1 T of minced garlic is the equivalent of 1 clove. That said, we love garlic so I added more. You really can’t go wrong with the amount of garlic. It is all about what you prefer. Feel free to improvise or to follow the directions. You can’t mess up the garlic. for those trying to watch our calories, can you sub milk for cream? I think it would work fine. If you give it a try let me know how it works. Or, just skip that all together. It is fine in an uncreamy state too. It was delicious – albeit not as creamy 😉 probably just as good without the dairy but glad I tried. The whole family gobbled it up!